Effective goal-setting for referees is very important, whatever you have achieved last year. Last week I posted the selfscan for referees, a useful tool to analyse your current refereeing status and work on development. That’s the basis for working on short-team goals. Today we’ll get a bit deeper into goal-setting and do that on many aspects of refereeing. Also think about training, career and lifestyle here. But what is a good way to do that? 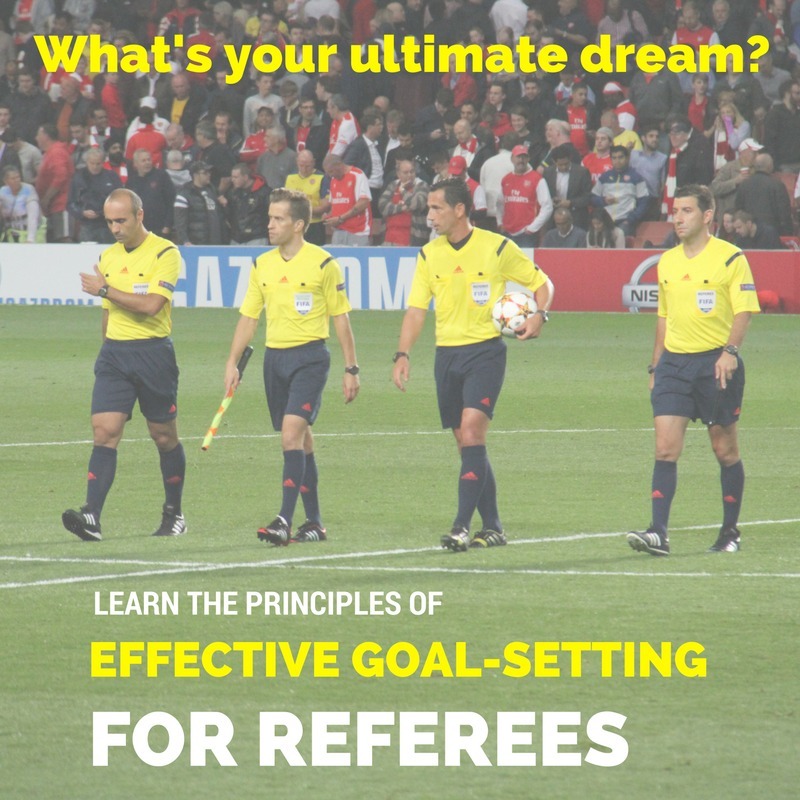 In this story you’ll get the principles of effective goal-setting for referees. Mark has now quit refereeing, but the story indicates quite well that it’s important to set new goals every year. So you’ll have to do it as well for 2018! 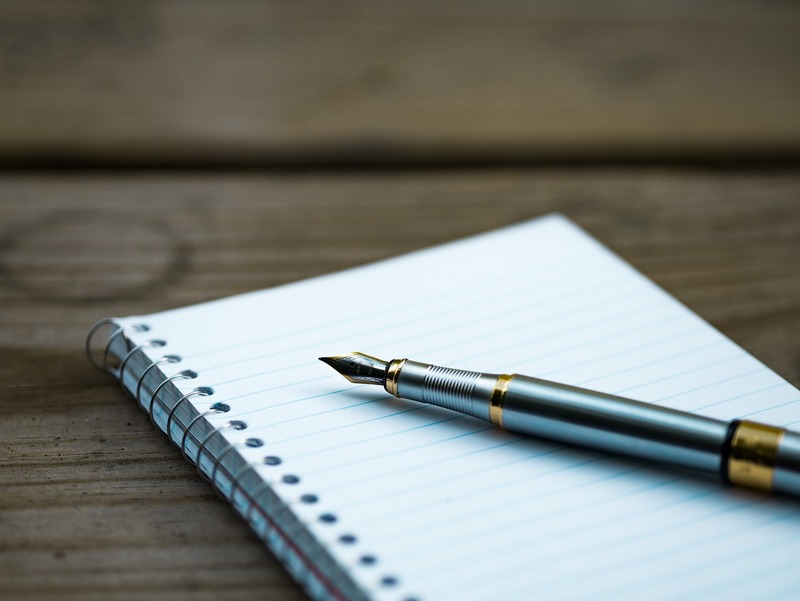 Get a paper sheet and write down your strenghts and skills that you can improve in these categories (and others). In the latter you’ll see things you can improve (and set goals for). Have no clue? Check your recent assessments for positives and negatives. Goal-setting is very important, as you have read in the blog post about creating your bigger picture. If you haven’t read that post, start with thinking about your bigger picture. What is it you’re willing to achieve as referee and why? “If you don’t know where you are going, you’ll end up somewhere else”, said Yogi Berra. In the first blog post of this series you’ve created your bigger picture, your ultimate goal as referee. In the interview with Gerry Duffy you got inspired to get uncomfortable, think bigger when creating your bigger picture. His idea: you can only reach a higher level when you get out of your comfort zone. Now it’s time to plan your route to your “referee destination”. Research has shown that goal-setting works best if you have long term goals (bigger picture) in conjunction with short-term goals. And now you know where you are heading, you can piece your bigger picture in smaller chunks. That’s important according to Frank Smol, professor of Pshychology at the University of Washington. He maps out an ABC for goal-setting that shows the basic requirements for you. Goals need to be achievable. A big picture is not easy to achieve at once, the smaller chunks are. If your goal is to become a FIFA referee in 2018, you probably won’t make it in 2018. “Some goals aren’t achievable”, says Mark Clattenburg. “A guy who’s at national level can’t referee mid-international level. But what he will do is set goals for the season to officiate whatever top match he can. And I do exactly the same.” So make sure your goals are realistic. Not too difficult, but also not too easy to achieve. It’s key to keep them challenging. Goals need to be believable. Each goal will help you getting to that bigger picture. “I work hard off the pitch to make sure I am ready for my games in the weekend”, mr. Clattenburg explains. And that he’s able to deliver his best possible performance. A referee must believe that he reaches his goals due to his effort in practice. There are three types of goals. The outcome goals are your long-term ambitions. They are the results of your actions and are usually the outcome of a competitive event. Good examples are becoming a FIFA or national referee, or getting more high-level games at your current level or earning a promotion by the end of the year. These are outcomes that contribute to your bigger picture. 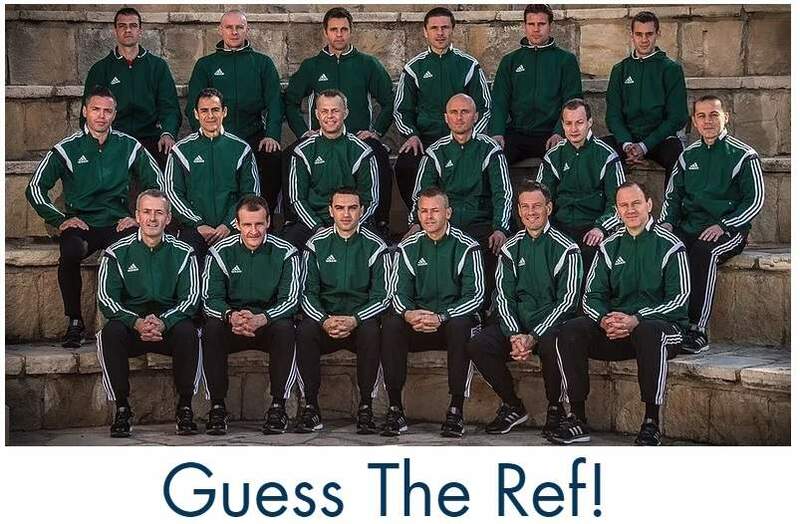 If you want to become a top FIFA referee as ultimate goal, you first need to get to the international level and officiate low-level Europa League Qualifiers. Before that you first need to reach the national level and get apointments for more important games there as well. This applies to all levels. A smaller outcome goal is earning a promotion at the end of the season, at whatever level you are currentlyu. Without promotions you won’t make a step up that ladder to get closer to your ultimate goal. However, the outcome goals are usually controlled by others. That’s the competitive element in earning a promotion. More referees want that place at a higher level. You need to take into account how an assessor judges your performance. It’s important to start with your outcome goals, so you know where you’re heading. Also discuss your real ambitions with a coach, so you fully understand what you want to reach. “By setting these [outcome] goals you can then take a deeper look at how you are going to reach them”, says Marc Birkett, a FIFA Futsal referee in Refereeing Magazine. How you’re going to reach the outcome goals is the next step. And you’ll have more influence on these type of goals. The action steps you need to take are the performance and process goals. The performance goals are the standards you want to achieve yourself and are independant of others. If it’s your performance goal to be able to sprint 6 40m sprints under six seconds, it’s up to you to reach that goal. You can train for that and reach the goal. A refereeing friend might be able to run it faster, but that doesn’t matter for YOUR goal. You are still able to reach that goal. Sometimes your goal isn’t about setting a certain time, but you want to learn something new. You want to improve habits, a skill or a part of your technique. These are process goals: actions that you’d like to complete during a performance. During a sprint you might want to use a certain technique at every start and during a longer run you want to run at the same pace constantly. “They are the hard work that leads to the exciting stuff”. That’s the perfect description on Sport Psychology Today. 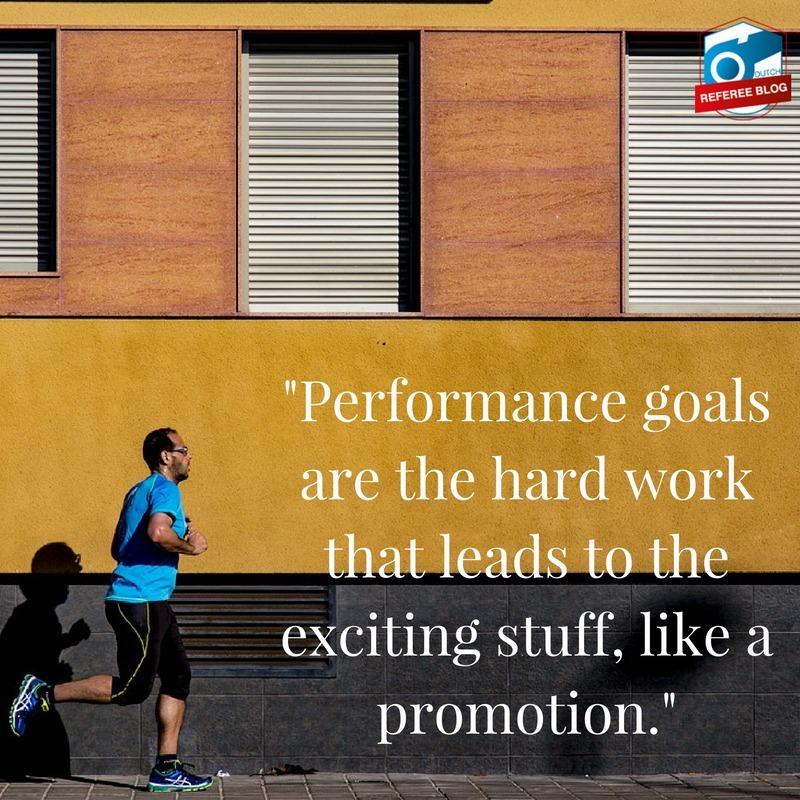 When accomplishing your performance and process goals you’ll get closer to reaching your outcome goals, such as a promotion. “That’s why you need to stay primary focussed on your performance and process goals”, says Gerry Duffy. The term SMART is often used when setting goal. It stands for: Specific, Measurable, Attainable, Relevant and Time-Framed. Your goals need to be easy to understand. Identify some action steps and use action verbs in your goal. Don’t pick a general goal like improving your fitness level. Yes, it’s easy to understand, but not specific enough. Pick: Join a gym [add date as deadline] and workout twice a week. How can you verify if you accomplished your goal? In the above example you can simply count how often you workout. You can even add to your goal that you need to workout 3 times a week if you don’t have a game in the weekend. Easy to measure. Another example: you want to earn a promotion at the end of the season (outcome goal). A requirement is to pass the fitness test, where you have to do 6 40m sprints under 6 seconds. That needs to be your goal: I want to be able to run 6 40m sprints under 6 seconds and I will train twice a month on my sprints. Referee or football associations offer tools for you to measure your sprint performance. If you have fitness goals on longer distances it’s easy to use a GPS watch to measure your time. You need to ask yourself if you have the capabilities to achieve a goal. If you’re overweight than it’s better to focus on loosing weight than setting goals for sprint performances already. Or if you want to improve both your sprints and endurance level and you want to train your stability and improve your self-confidence, keep more focused, and so on. You need to make sure all commitments you make with yourself are realistic and fit into your schedule. The goal needs to relate to your broader objectives. It’s important to improve your fitness level, but setting a goal to run 6 40m sprints under 5 seconds is irrelevant. Nobody expects you to do that and it’s not a requirement on your refereeing path. There are probably other things you want to improve at, so pick things that are relevant to your bigger picture. Don’t think only in season goals. Short-term goals will give you a better view of where you’re heading. And if you see after three months or half a year that it’s impossible to reach the final goal, you can adjust it. It’s very important to be flexible. I’ve mentioned the example of the sprints on the FIFA fitness test above. You’ll have the end goal for the end of the season in mind. But if you have a whole season ahead, you can write down mid-season goals. Mid-season I want to be able to run 6 40m sprints in 6.2 seconds and I will train twice a month on my sprints. And at the moment you’ll have to do the test, you need to be able to run 6 40m sprints in under 6 seconds. You can even add goals for 3 or 9 months. The mid-season goals are an extra step that will give you direction in where you’re heading. So it’s very important to add a time frame with a beginning and end date to your goal. Working with smart goals is very important. It will also help you to write positive goals and that you are flexible. So don’t write down: I will no longer sprint 40m in more than 6 seconds. Leave the negative like ‘no’ out of your goal. Choose for: I will run all 6 sprints of 40m under 6 seconds. It’s good to create a bigger picture and have your lifetime goals mapped out, but what if there’s a hick-up in your career? You might miss a promotion oppurtunity. Or what if you have set goals about your physical ability but the requirements ordered by the authoraties change? Or sometimes you’ll get injured. In those cases you must be flexible. Review your goals and adapt if necessary. This does not mean your end goal has to change. But your steps to that end goal might differ. In the examples above I’ve mentioned a lot of fitness goals, but you can set them also in the other categories I mentioned. These are some examples of goals you can set for yourself. Behind brackets you’ll see the goal that’s behind the process/performance goal. Talk with at least 5 players who made a foul during the first half. (Interpersonal goal: work on your interpersonal skills so you’re able to pro-actively prevent them from making bigger fouls) Don’t obsessively try to have long talks with players, but writing this goal down reminds you that you need to talk (for example because one of your skilss you want to improve was interpersonal contact). Of course distances and time frames may vary. And you can pick your own goals based on the strengths and skills you want to improve that you wrote down. These are just examples of what goals look like. Now it’s time to set your own goals. To make this step easier for you I have created a worksheet for you. You’ll go to a Google form which you can download and adapt. 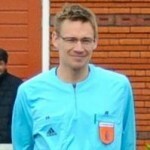 If you have further questions or remarks, feel free to contact me on jan@dutchreferee.com. I’d love to hear your goals and what your action steps are. Feel free to share yours and we can discuss them together privately. Good luck in reaching your ultimate goal! ← Touching the ball twice at penalty kick: allowed or not? 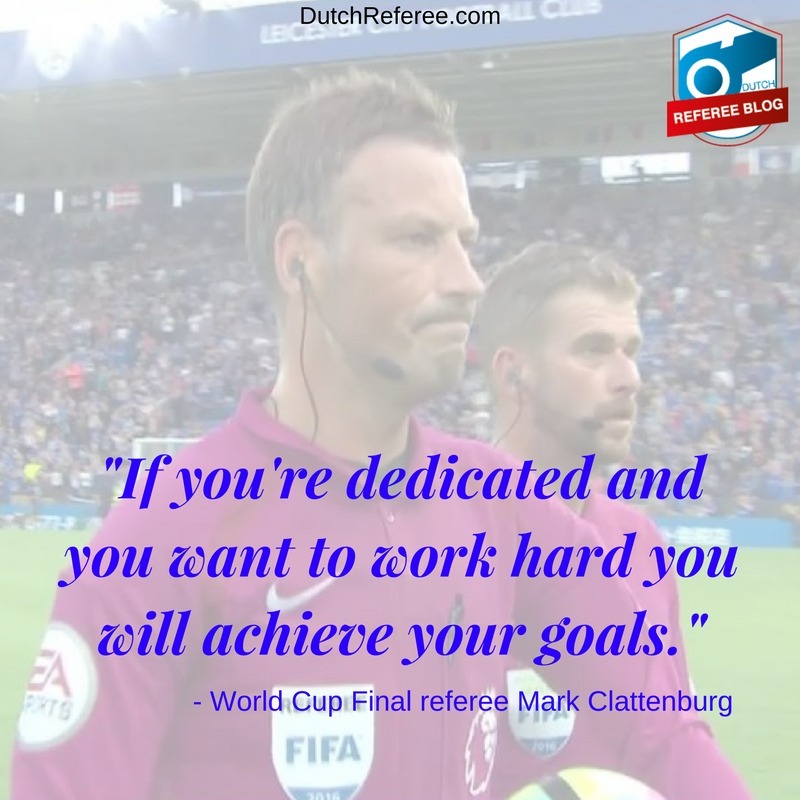 Very good but you might want to change the photo quote as Mark Clattenburg never refereed the world cup final. He did however do the Euro and Champions League final.